You won't believe the ridiculous foods thrown into the deep fryer at this year's Texas State Fair. Hello heart attack! If there’s one thing we can depend on as a society, it’s fried greatness from the State Fair of Texas. The 24-day “fried food capital of Texas,” running until Oct. 19 in Dallas, includes live music, livestock competitions, an auto show and, most importantly, a grand exhibit of all the different foods that can be thrown into a deep fryer. 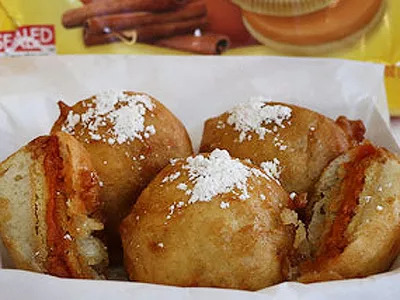 This year, the fair featured another slew of new fried absurdities, including Deep-Fried Sweet Tea, Deep-Fried Brisket and Deep-Fried Pumpkin Spice Oreos. And a lot of things “sprinkled” with powdered sugar. Warning: Viewing the below photos might cause a heart attack. The Fry Dog is exactly what it sounds like: a hot dog wrapped in french fries and then deep-fried until it’s one big piece of crispy, junk food on a stick. The South’s signature drink is combined with their signature cooking technique by blending brewed sweet tea into a custard filling. It’s then coated in a graham cracker crust, deep fried and topped with sweet tea syrup. This barbecue-gone-wild is smoked for 12 hours before hitting the fryer. It’s served with fried onion rings, barbecue sauce and pickle slices. A good way to start your morning in Texas. The popular Thai hot sauce sauce is mixed with shredded chicken, corn, green chilies and tomatoes, rolled into balls, breaded with crushed tortilla strips and fried. Entry #8 in the #bigtexchoiceawards @statefairoftx is Fried Sriracha Balls. Ooh Wee! They should call these Fire Balls! The season’s most popular flavor is now a battered, fried, doughy sphere of pumpkin cheer. Yes, that’s really what they’re called. How it’s made: Chocolate cake, chocolate frosting, maple syrup and bacon pieces are rolled into balls and then, of course, deep fried. The balls are dusted with powdered sugar, drizzled with chocolate and maple syrups and—just for good measure—topped with more bacon crumbles. 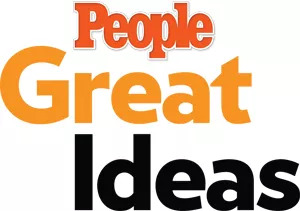 Check out 8 more crazy fried foods at PEOPLE Great Ideas.